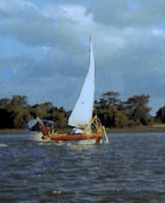 The first foiling moth we know of was Frank Raison’s wooden scow in 1974. The photos are poor but I have spoken to Frank about it and understand it foiled reasonably well across the wind in ideal conditions. He said the foils and supporting structure were timber and heavy, but it stands as quite an achievement for the time. The photos seem to indicate a surface piercing V formation but Frank’s memory was not clear. He is in his 70s and still sails an international canoe remarkably well. The next evidence is 20 years later from Andy Patterson in the UK. He was also responsible for the first very narrow hulls. It appears to have foils on each corner. He certainly foiled well but not well enough around a course to race successfully. A great moth innovator, Andy was the man who created the first truely narrow moth. 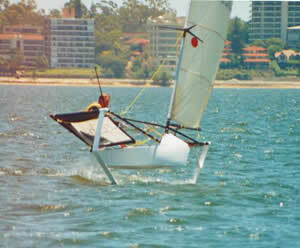 In 1998 I saw Ian Ward’s second foiler. 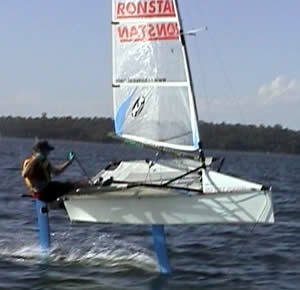 It had a mechanical sensor controlled wing tip mounted T foils and was very stable until one foil was disturbed and then it had the habit of throwing Ian off the boat. So by 1999 he had reduced the system to just two foils, one on the centreboard and one on the rudder. Getting close to the modern moth but at that stage with no means of control except weight movement. It foiled, but it also crashed well. 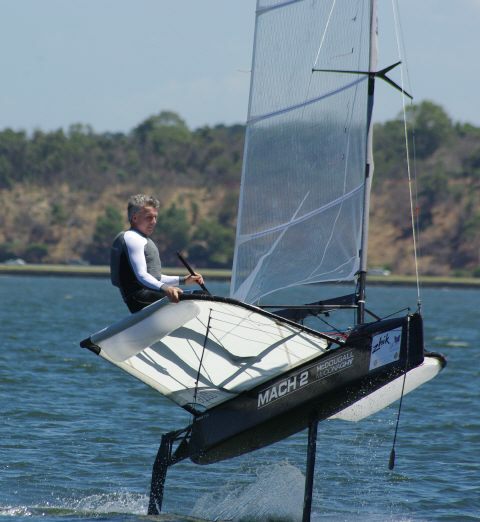 In 2000 Brett Burvile entered the Perth Moth Worlds with a Mark Pivac designed trifoiler, Sloping wing tip mounted mainfoils, acting like surface piercing V foils, not unlike the arrangement on many 2014 design catamarans. This proved very fast on the reaching courses used at the time and won two heats of the event, it also had the habit of throwing Brett off the boat when turning. Its a milestone boat and is now in the Fremantle Maritime Museum with Australia 2. It made the moth class aware that foiling was going to be viable and in doing so divided people for and against. 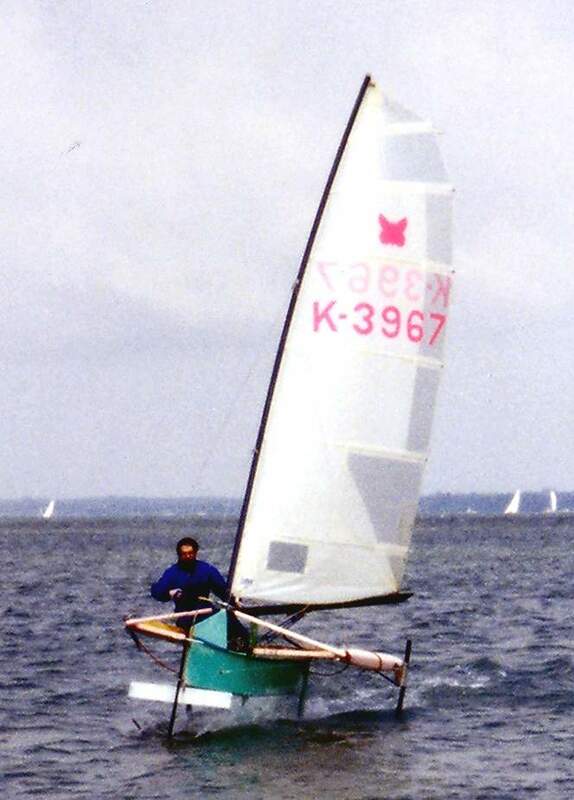 The class management were determined to maintain the class as an open development class but did not want it to turn into a foiling trimaran class, so they reinterpreted the One Hull rule to require that all foils exit the hull below the static waterline, hence banning wing mounted foils. 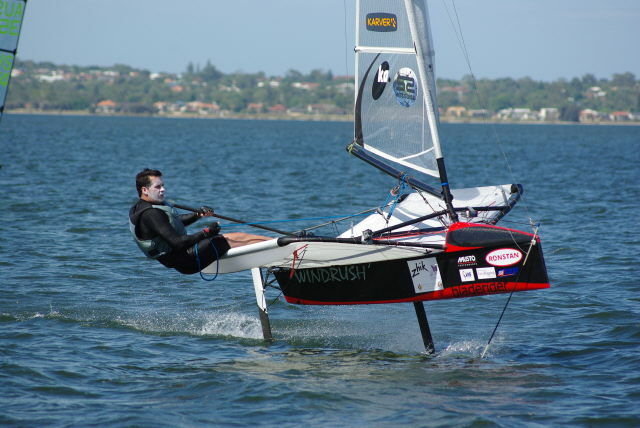 The foiling enthusiasts were not deterred, various configurations were tested and rejected, but notably again in Perth, John and Garth Ilett with help from Burville and Pivac went back to Ward’s inline foil concept and added the bow mounted wand to control the flap and hence control height. It took some time to get the mechanism to do what was needed, but when they sold their first production version to Rohan Veal things accelerated rapidly. 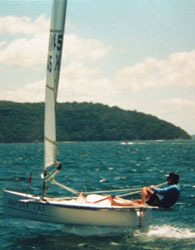 Rohan spent many hours sailing and refining both the boat and the new techniques required, Making the linkage system smoother and more responsive, learning that the rig had to change form full and twisted to flat and untwisted as soon as the hull left the water and speed doubled. Meanwhile John tried different cross sections for the verticals and horizontals and refined the plan forms of the lifting foils. Significant design developments were either invented or discovered at this stage, The centreboards were initially raked forward to widen the spacing between foils but it was found that the forward rake also prevented air entraining down the centreboard leading edge and causing ventilation of boat the vertical and horizontal foils, While all the early Ilett boats had forward raked centreboards it took a lot longer for rudder foils to get similar treatment, and rudder ventilation remained a problem for some time. Rohan is also credited with realising that 15 to 20 degrees of windward heal makes a huge difference to how a moth sails. It allows the main lifting foil to contribute lift to windward and complete unload the centreboard of all side loads, greatly reducing drag. There is also a slight righting moment gain from moving the small mass of the boat to windward of the centre of lift. Then Andrew McDougall (AMAC) realised the market potential, mortgaged his life and spent two years creating the Bladerider. Not only was it built in China in big numbers it also had some significant refinements in the foil design, control systems and the rig, all of which made it a faster boat then the Prowler. The refinements in the foil section used a more modern low camber section, with a larger % of flap, as well as a more efficient all tilting rudder. The rigs became stiffer and the sails more controllable. Bladerider suffered business problems, AMAC lost control of the company and in the end a change of Chinese builder saw terminal quality problems. But AMAC knowing what was wrong and right designed a new boat and went back to McConaghy and created the Mach2. Again with more refined foils and systems and after 5 years, a business success. 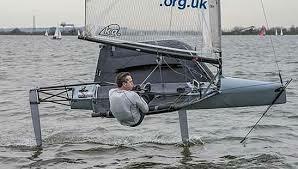 This article is very largely based on a talk given by Phil Stephenson at The Foiling Week 2014. I wish to thank him very much for providing me with it and a very enjoyable few hours discussing the history of the Moth with me.